Herb Ruffin is Associate Professor of African American Studies at Syracuse University. He holds a Ph.D. in American History from Claremont Graduate University, California. His research examines the African American experiences in Silicon Valley (California), San Antonio (Texas), and in particular, the process of Black suburbanization in the American West from 1945-2010. Professor Ruffin’s book Uninvited Neighbors: African Americans in Silicon Valley, 1769-1990 was published by the Oklahoma University Press in 2014. 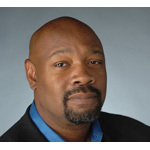 In addition, he has authored numerous articles, book reviews, and online academic publications that focus on African Diaspora History and Culture, the Black West, Urban Studies and Social Movements. Moreover, Ruffin serves as an appointed committee member on the Organization of American Historians Committees of Committees, and on BlackPast.org’s advisory board. He has also been an active consultant in regard to organizing curriculum, public exhibits, and historical presentations on Africa and African Diaspora history and culture, including work with the Smithsonian Institution, Africa Initiative, and serving as U.S. Historian Delegate to South Africa.